With the Super Bowl in just a couple of weeks, I thought it would be fun to put together a few fun football trivia games that you could play with your family or the guests you have over for the big game. I went over the trivia games with my husband before posting here and he didn’t get many of the answers correct. I can’t fool him on a hockey question but he’s not so good with the NFL. Since we’re Canadian, this isn’t a big surprise. Hopefully your football knowledge is better than ours! This first one is a fun game that the whole family will enjoy! Simply match the mascot with the correct NFL team. For example, if you think that the mascot for the Buffalo Bills is Rowdy, then you’d put a “H” beside Buffalo Bills. Click here to print the free Mascot Trivia Game. I put this second game together with the help of some research on Wikipedia. You can browse that Super Bowl page for even more fun facts. 1) When was the first Super Bowl? 2) Which team has had the most Super Bowl victories? 3) What is the Super Bowl trophy called? 4) How many times have the New York Giants won the Super Bowl? 5) There are 4 teams who have never appeared in a Super Bowl. Name these 4 teams. 6) What team won the first Super Bowl? 7) Who starred in the 1993 Super Bowl halftime show? 8) What city has hosted the most Super Bowl games? Will you be tuning into the Super Bowl? If so, who are you cheering for? Let us know in the comments below. 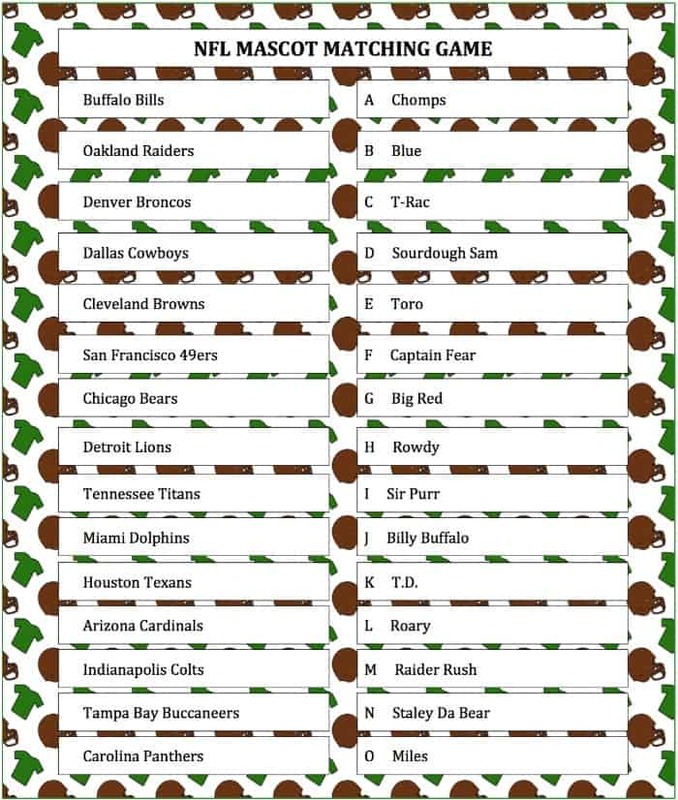 For more fun games, visit our Free Printable Game page. You can also stay updated on the latest ideas for family fun by following us on Facebook, Twitter, Pinterest and Bloglovin’. Thanks for sharing this on our Artsy Play Wednesday Link up. Great idea. What a great idea! This would be a fun idea for the kids to play while waiting for the Big Game to start. I’ve pinned it to my Football Party board and will definitely be back to print a few copies this week. Thanks for sharing, especially since Football isn’t really your sport. I’ll bet I would do terrible at a Hockey version. I’d like to invite you to share this at our Shindig Saturday party happening now. Thanks again for the fun game! My son will LOVE this! Thank you for sharing at the After School Linky! Thanks for sharing! My husband will love this. Good catch, Rebecca! I’ll have to update that. Yes, I’ll be tuning in. And sorry, Eagle fans but I won’t be cheering you team on. Sorry.